This week I finished my Fergus Shrug! It turned out much thicker than I thought it would – but don’t all cable projects turn out that way? I followed the pattern instructions without altering it and I love it. I think the only thing I might change is to sew up the arm seams a bit. I have only wore it once around the house (it’s in the high 70’s in Florida) and it slipped off my shoulder. Pretty sure if I go from the underarm seam towards the center some it will take up the gap. I dug through the stash and found some red, white and blue cotton yarn that I am going to make some Color Burst coasters and Palmeras placemats with. 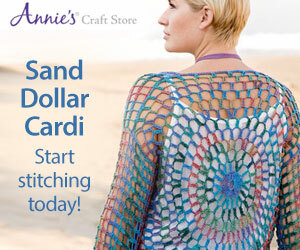 I got the pattern on Annie’s Catalog and I am excited. In their pictures they used bohemian colors that really pop but that won’t work with my house. So we are doing an ‘America’ set. I just have to figure out how to stripe them. The originals have 6 -7 colors. I had to break down and buy the yarn for a spring sweater I want to make called Breaker’s Tee because I didn’t have 7 skeins of clothing cotton yarn, but I really want this sweater for my trip this summer with the family. I also finished cleaning out the office. Turns out if you take out all the storage tubs full of yarn and fabric you have a lot more space to work with. I am still dreaming about my studio I will have one day but for now at least I can actually work on the table! Podcast of the week is the Goal Digger podcast with Jenna Kutcher. I have been listening to her for a while and love her. She talks about how you can meet your goals in life both personal and career. You might have seen her in the news because she went viral this week for smacking down trolls who questioned how she landed her hottie husband. She wants to help you to figure out how to live your best life. Check her out and let me know what you think.